I’m working on a 150 artboards document for an app. I’m using an export preset that saves in 3 files per artboard. I’d like to export only modified artboards or a selection of them and countinuous export isn’t the solutions for some cases (a symbol on all artboards is like and export all). Now we have the ability to export New items only, Export all slices or export only selected output files. I’d like to have the option to select the slices from Slices panel, then get in the export panel an Export selected button. A “select/deselect all" in export panel could help too. I'm not sure i understood your post correctly but you can already select which slices to export when clicking the Export Slices button in the Slices panel. 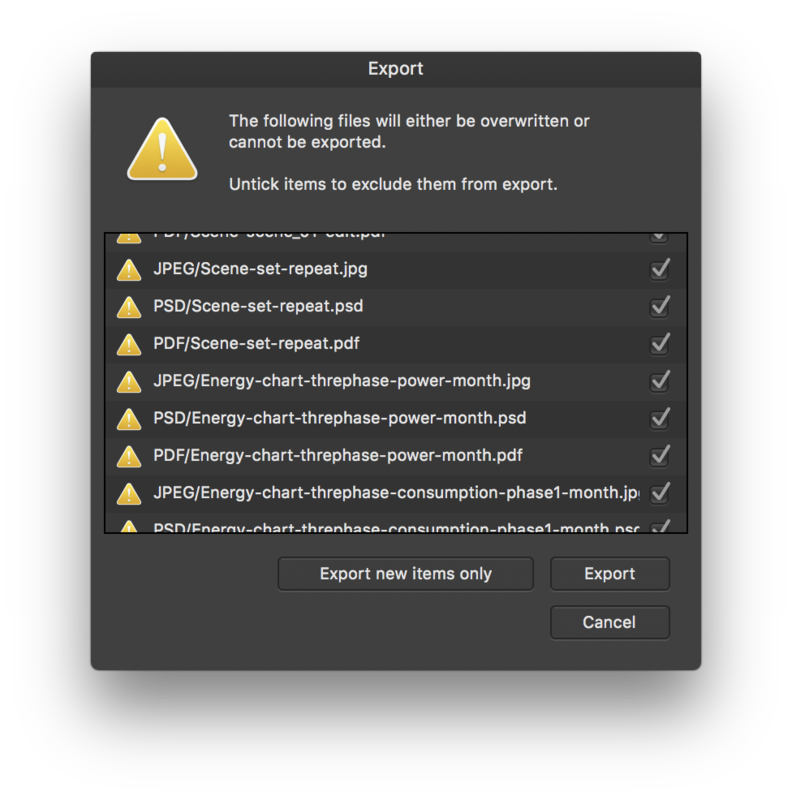 Simply untick/uncheck the checkbox of the slices you don't want to export. You have understood what I mean, but in my situation I have to uncheck 150x3=450 output files if I need to export only one artboard, so a select/deselect all slices button could help; an Export selected slices could be better. An additional improvement could be assigning the Continuous export binded to a slice, not for all the project: using for UI design with symbols, the useful a continuous export becomes unusable on large project because now, on each change all the slices are re-exported. I second this... having hundreds of slices to export and then having to update 10 of them and exporting just these updated one is a pain as I have to deselect all of them and then just check these 10. 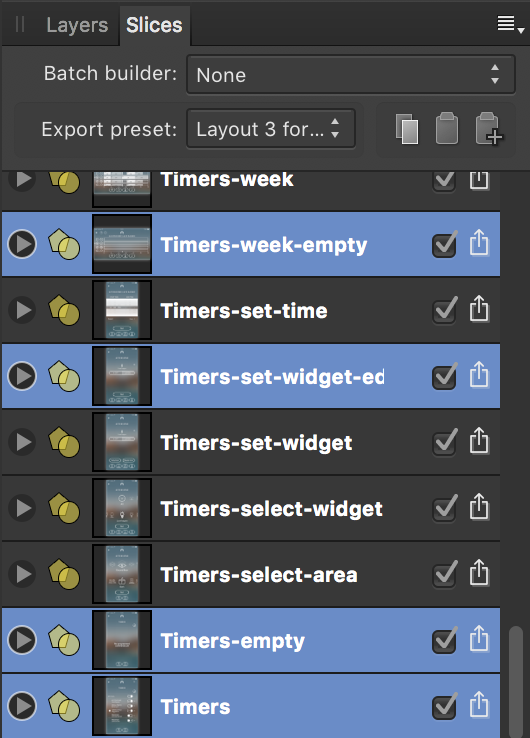 A feature of exporting just the selected ones (not the checked ones) would be awesome and speed up the workflow. When you look at the Slices panel, there's an icon to the right of the selection box/checkbox, which will export just that slice, ignoring the others. Wouldn't that do what you want? I know about that... but when I have like 10 slices or more, I have to click each one to export it one by one, then click Save each time, which is time consuming and ridiculous considering the potential of a productivity software like AD. I don't think I'm asking much... the functionality is already there. Just need a button at the bottom that says: Export selected slices. That's it.